I was really excited about this series - this book. "The Last Kingdom" TV series is currently my absolute favorite series. I love that though there are many "negative" things happening in Uhtred's life (the MC) it's only part of what makes it, and him so realistic. Life could be glorious but it can also throw you curve balls. Uhtred grew up, become someone, fell in love, accomplish things and yet had his own failures. There are so many things that takes YEARS for Uhtred to accomplish but the persistent person that he is, he stubbornly accepts no defeat he only charges on. I didn't get that far into the book. Uhtred is only 10 years old in the 19% I've read of this book and sadly I know that I can't continue on.. 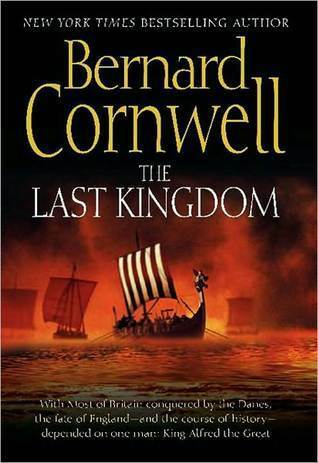 The story is told from Uhtred's POV yet years from now when he is an old man (or older man? I'm not sure exactly). IIt made me feel distanced from the occurrences in Uhtred's life. Also there is too much of the mundane. Too much of the basic daily live and what it entails. It's nice seeing the kind of kid Uhtred was but frankly I would have enjoyed much more a more "to the point" approach. There was a lot going on in Uhtred's life in the 10th year of his life. From being the son of the lord of Bebbanburg, he became a slave to a Dane lord - Ragnar, though he was always considered much more. Uhtred showed his worth to Ragnar time and time again and so Ragnar kept him by his side and educated him in the ways of the Danes. At that point in time Uhtred was still trying to decide if he is still English or is he becoming a Dane. There is a lot of promise to the story, as the two seasons of the TV series shows. I think you need to be much more patient than me to enjoy this book and also a "strong stomach" because Bernard has no problem describing killing of both animal and men. Maybe someone who is more into Historicals, who is interested in the lives those people lived would enjoy every little detail Bernard describes. In a way I found it beautifully realistic, like I could envision those people and what their lives entailed, but on the other hand I was impatient to get to "the story", "the adventure", to see Uhtred grow up into the man I so enjoy seeing in the series. Not a perfect guy, a man who is trapped inside his own ambition of getting back his land and being the lord of Bebbanburg. He has years to mature and grow up into the spectacular man who can make his dream come true, but sadly I'll have to follow those through the lense of the TV series' director and not through the books.